With algos trying to force a rally for the third day in a row, the "STFR" crowd arrived early as stocks in Europe and S&P futures surrendered early gains as investors initially bought on the latest optimistic developments in America-China trade relations, which however turned into selling after a BBG report that the ECB - as everyone had already expected - will lower its inflation forecast for 2019 when it publishes an updated outlook on Thursday. As Bloomberg adds ECB projections foresee CPI slightly weaker than the 1.7% previously expected for next year, and the outlook for GDP has also been revised down. 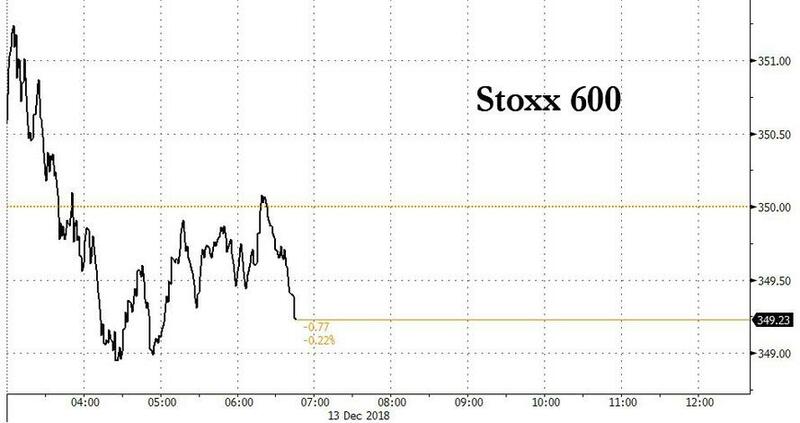 Europe's Stoxx 600 declines were led by energy shares as oil slide back under $51, offsetting gains in raw materials as the index erased an early advance to turn lower. Hong Kong and Chinese stocks outperformed as equities across Asia continued their rebound ignoring news that a second Canadian citizen had "disappeared" in China. In the U.K., gilts climbed and the FTSE 100 edged lower after May won a vote of confidence in her leadership of the Conservative Party, though it’s likely to be only a temporary reprieve as the embattled premier faces hardened opposition to her Brexit deal. 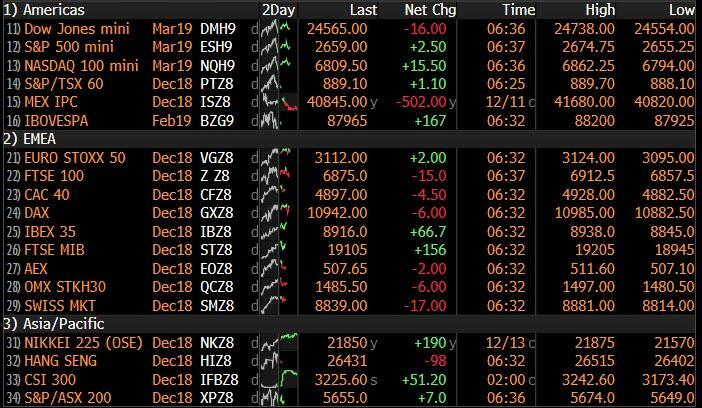 Earlier, the Nikkei and other Asian stocks had pushed roughly 1 percent higher ahead of several central bank meetings including a landmark one for the ECB which was set to end its quantitative easing program. Gains were concentrated in Chinese shares, with Chinese blue-chips up 1.5 percent and Hong Kong’s Hang Seng index gaining 1.1 percent. Japan’s Nikkei stock index ended 1 percent higher, while Australian shares gained 0.1 percent. 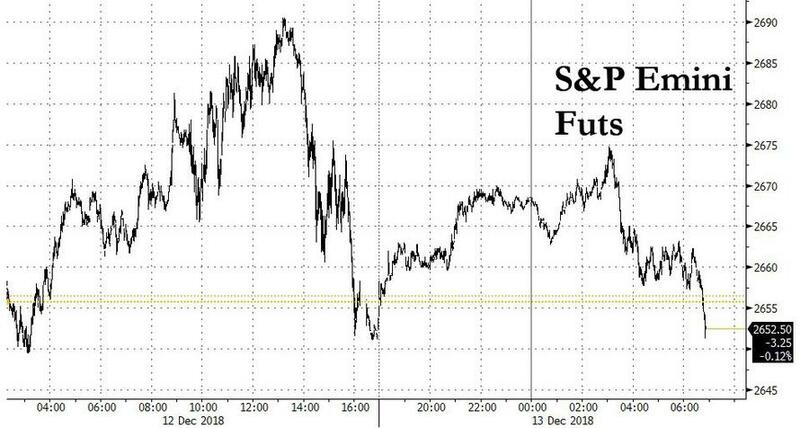 Futures on the S&P 500 initially rose after news broke that Chinese importers have bought U.S. soybeans, though they since hit an air pocket and dropped after US traders got to their desks and after PBOC Governor Yi Gang warned that China's economy faces rising downward pressure. And since the market is entirely controlled by algos, spoos hit yesterday's lows before rebounding. Investor optimism was boosted on Wednesday after China resumed purchases of American soybeans and reiterated its officials were in close contact with U.S. counterparts on negotiating details of a broader deal, while considering revising the controversial "Made in China 2025" strategy. Still, worries for global relations remain after China detained a second citizen of Canada for questioning, further heightening tensions between those two countries. Also on Wednesday, Trump administration officials signaled that Beijing will have to do more to end the tariff war. US Treasuries popped higher as NBC suggested that Trump is increasingly concerned about impeachment, while in Europe Italy's BTPs resume their upward trend, breaking through 126.00 after PM Conte confirmed that Italy's proposed budget deficit has been cut to just the laughably precise 2.04% in Italy's latest concession to the European Commission. Two-year Italian bond yields tumbled to 0.51 percent which took them back to where they were before a late May eruption of tensions triggered the worst day for short-term Italian debt in 25 years. Italy’s five-year and 10-year government bond yields dropped to their lowest level in 2 1/2 months and the closely watched Italy/Germany 10-year bond yield spread improved to its tightest since the start of October. “I think the momentum can carry on in the near term as we have a number of supportive factors for Italian debt beyond just the hopes the budget deal can be reached,” said Commerzbank rates strategist Christoph Rieger. The euro was steady as the ECB was said to be lowering its inflation forecast for 2019 in an outlook due Thursday, while the dollar was little changed. The pound added to its advance after May survived an attempted ouster, although little has changed on the ongoing Brexit impasse. The Norwegian krone was the biggest gainer versus the dollar as the central bank maintained its key rate but said it sees a hike “most likely” in March 2019. The yen weakened against all of its major peers as demand for haven assets waned amid signs of a further thaw in U.S.-China trade ties. On Brexit UK Prime Minister May was heading to an EU summit in Brussels following her confidence vote win to try and get some additional concessions on the controversial Irish border aspect of the agreement to placate rebels within her own party and Ulster unionist allies. Markets reckon May’s continued premiership for now makes a ‘no deal’ Brexit less likely at the margins and her survival takes at least some of the immediate headline risk out of the market – even if the Brexit impasse is really no clearer. Elsewhere, WTI oil slipped below $51 a barrel as a smaller-than-expected decline in U.S. crude stockpiles renewed fears a global glut. In terms of recent newsflow, the latest IEA’s monthly report saw the agency cut non-OPEC oil supply growth forecasts by 415,000 BPD to 1.5mln BPD vs. 2.4mln BPD in 2018. The IEA also left global oil demand growth unchanged at 1.3mln BPD and 1.4mln BPD for 2018 and 2019 respectively. This follows yesterday’s monthly OPEC report where demand estimates were left unchanged. Gold is trading flat within a slim USD 2/oz range, as the dollar steadies with the DXY unchanged on the day. Base metals continue to see support after yesterday's news that China are preparing to increase access for overseas companies with sentiment also bolstered this morning after the Chinese Commerce Ministry stated that they would welcome a US trade delegation visit. Asian equity markets traded positively as the region followed suit to the gains on Wall St amid trade-related hopes after news of further potential concessions by China. As such, ASX 200 (+0.1%) and Nikkei 225 (+1.0%) were higher but with gains in Australia capped by losses in the telecoms sector after the competition regulator expressed preliminary concerns regarding proposed TPG Telecom - Vodafone Hutchison Australia merger which resulted to a near-17% drop in TPG shares, while property-related weakness also restricted upside. Hang Seng (+1.3%) and Shanghai Comp. (+1.4%) were lifted amid the encouraging trade-related developments with China preparing to increase access for overseas companies and is working to replace its Made in China 2025 plan with one that tones down its bid to dominate manufacturing, while Chinese importers have also resumed purchases of US soybeans and are said to purchase as much as 2mln tons of US soybeans vs. earlier reports of 500k tons. Finally, 10yr JGBs traded lacklustre amid gains in stocks and similar subdued price action in T-notes, with a mixed 5yr auction result adding to the drab mood. Major European Indices are mixed with the FTSE MIB (+1.0%) outperforming due to the indices banks outperforming on Italian PM Conte stating the nations deficit goal is now 2.04%; while the EC comments that good progress has been made on this. FTSE 100 (U/C) is trading flat, with Associated British Foods (-0.6%) and 3I group (-2.1%) trading ex-dividends towards the bottom of the index. At the top of the index are TUI (+5.0%) expecting 10% underlying earnings growth at constant currencies for 2019. In terms of other notable movers G4S (+9.0%) are reviewing separation options for their cash solution business and Sainsbury’s (+1.3%) are up as they are challenging a refusal for additional time by the regulator regarding their merger with Asda. Sectors are broadly in the red with some underperformance seen in Energy while Utilities are the outperforming sector. In currencies, GBP, EUR – Sterling the major G10 outperformer in the aftermath of PM May’s confidence vote victory last night, with some support also provided by the a draft document including the possibility that the EU are to look into giving more backstop assurances. As such cable remains firmly above 1.2600, albeit off highs of 1.2685 with large options around 1.2650-60 (1.2bln) perhaps hampering further attempts towards 1.2700. Meanwhile, the EUR also feels some benefit from the softer dollar, but is lagging vs. the Pound as EUR/GBP slips below 0.9000 ahead of the ECB policy decision. Note: please refer to the research suite for a full preview. NOK, CHF – Staying with the Central Bank theme, two out of the four end of year meetings have already passed and the Norwegian Crown strengthened in light of the Norges Bank’s current assessment reaffirming that rates will “most likely” be raised in March 2019. This, alongside upgrades to core CPI pulled EUR/NOK to lows of 9.7071 (vs. high of 9.7531). Conversely, the CHF was largely docile in wake of the SNB keeping its key rate and corridor unchanged, as expected. The Swiss Central Bank also maintained that the Franc is “highly valued” alongside reiterating its preparedness to intervene if required and utilise the balance sheet to react in the event of shocks. Note, SNB Head Jordan stressed the risk of major and sudden exchange rate movements which would significantly alter monetary conditions. As such EUR/CHF remains within a the bottom of a 1.1301-1.1281 range. AUD, NZD – The high-beta currencies continue to prosper in the more positive US-China trade environment, with the with AUD/USD building on gains above 0.7200 to just shy of 0.7250 at one stage, but also wary of big option interest at 0.7200 (1.3bln). Meanwhile NZD/USD remains sub-0.6900, albeit near the top of a 0.6880-42 range despite the downward revisions in the New Zealand HY economic and fiscal updates. In commodities, Brent (-0.3%) and WTI (-0.4%) are down on the session in a continuation of yesterday's price action. In terms of recent newsflow, the latest IEA’s monthly report saw the agency cut non-OPEC oil supply growth forecasts by 415,000 BPD to 1.5mln BPD vs. 2.4mln BPD in 2018. The IEA also left global oil demand growth unchanged at 1.3mln BPD and 1.4mln BPD for 2018 and 2019 respectively. This follows yesterday’s monthly OPEC report where demand estimates were left unchanged. Whereas, non-OPEC oil supply in 2018 is forecast to grow by 2.5mln BPD, which was an upward revision of 190k BPD; with this in mind, some suggest that OPEC will need to make further cuts over the second half of 2019. Gold is trading flat within a slim USD 2/oz range, as the dollar steadies with the DXY unchanged on the day. Base metals continue to see support after yesterday's news that China are preparing to increase access for overseas companies with sentiment also bolstered this morning after the Chinese Commerce Ministry stated that they would welcome a US trade delegation visit. Copper prices have hit a 1-week high on these trade developments. Separately, steel prices have risen on a potential boost to demand arising from expectations that China are to launch more infrastructure products next year. There were high emotions last night as UK PM May now has to write 117 fewer Xmas cards after winning her leadership battle by a vote of 200-117. That result is enough to insulate May from another leadership challenge within the next 12 months from within her party. However, more than a third of her party and likely more than half of her backbenchers voted against her and the result was less supportive than most thought beforehand. The pound had already gained as much as +1.47% to above $1.265 in advance of the vote, as it became clearer that May would have sufficient support to win the confidence vote. However, with the actual margin less than expected the currency surrendered around a third of its gains at one stage before closing up +1.14% on the day after the vote. Overnight, it held that advance and is trading around $1.262 as we go to print. So after all the noise, we’re left where we started. As before, the eventual outcome and the implications for UK assets will depend on May’s approach. Will she allow for modifications to her deal, or press ahead as-is? In her brief speech after the result she acknowledged the opposition in the leadership results and to the deal but didn’t immediately appear inclined to change tact. Her tactic at the moment still seems to get concessions out of Europe. Problem is, it seems quite clear that her European partners will not offer any of note. Basically, it all boils down to the backstop on the Irish situation. On this it’s worth noting that EU leaders are due to meet later today to discuss their position. Let’s see if a rabbit is pulled out of a hat. Seems unlikely. Where this ends is still highly uncertain. If a solution to the backstop can’t be found, we will probably have to pivot to a totally different tactic. Either a much softer Brexit (EEA type arrangement) or maybe a second referendum. Aside from the Sterling move, this morning in Asia markets are off to a solid start with the Nikkei (+1.08%), Hang Seng (+1.22%), Shanghai Comp (+1.47%) and Kospi (+0.76%) all up. More signs of diffusing trade tensions seem to be the driver. The US Soybean export council said late yesterday night that Chinese importers have purchased 1.5mn to 2mn tons of US soybeans over the last 24 hours thus providing further evidence that the talks are moving in the right direction. Meanwhile, yesterday’s story in the WSJ about China working on a replacement for its ‘Made in China 2025’ plan with one that plays down its bid to dominate manufacturing has also aided sentiment. The article is noteworthy as it is the first sign that we’ve seen on a compromise on issues between the US and China that go beyond the bilateral deficit and focus on specifics. Futures on S&P 500 are also up +0.35% overnight while the CNY is +0.20% stronger. Those moves overnight come after an impressive first half to the session on Wall Street yesterday but one that saw intra-day gains fade yet again. US markets still rallied +0.5 to +1% but gains of over +1.8% to +3% were seen earlier depending on the indices. Before this we saw another strong day for risk in Europe. Indeed, it felt like you could take your pick from a number of riskfriendly catalysts yesterday. Hopes that Brexit can have a softer bias with a May win, further signs of softening on the budget in Italy, a steady as she goes US CPI print, the WSJ story about China above, and talk of President Trump intervening on the Huawei case to push through a trade deal with China, all played a part. In the end, the S&P 500 (+0.54%), DOW (+0.64%) and NASDAQ (+0.95%) stayed higher after the blip while in Europe the STOXX 600 closed +1.69% to clock up its best two-day run since July 2016. European banks also bounced +2.99%. Treasuries were well offered with 10y yields climbing +3.1bps, while the 2s10s curve finished +2.2bps steeper. Elsewhere, the FTSE 100 (+1.08%) lagged a bit, which was understandable with the Sterling move, however, the more domestic focused FTSE 250 did rise +1.90%, while the FTSE MIB climbed +1.91% and CAC +2.15% – the latter seemingly still reacting to the budget measures announced by Macron. HY cash spreads in the US and Europe were also -8bps and -11bps tighter respectively. The more notable moves in Italy yesterday were for Italian Banks, which rallied +3.0% while 2y and 10y BTP yields fell -7.7bps and -11.9bps, respectively. The latter closed back under 3% (at 2.996% to be exact) for the first time since September with the catalyst being the reports about Italian Premier Conte potentially proposing a 2% deficit target for next year. After Europe closed it was confirmed by Conte that the revised budget would be 2.04% of GDP. The euro also gained +0.46% on the day on the news while other bond markets in Europe were more mixed, however 10y Bunds did climb back up +4.6bps to 0.276%. Elsewhere, as noted above, yesterday’s US CPI print didn’t do much to move the dial with the unrounded core reading of 0.2093% for November more or less bang on expectations. That did, however, confirm a move higher in the year-on-year rate to +2.21%, which puts it at the highest since July. Both the three-month and six-month annualised rates also ticked higher to +2.1% and +2.0%, respectively. That should alleviate concerns over the slight recent slowdown in core inflation, which had seen the 3m annualized rate dip to 1.6% last month. As markets continue to debate the fallout from last night’s confidence vote, there is at least the distraction of an ECB meeting to look forward to today. As a reminder, our economists expect the ECB to confirm that net asset purchases will cease at year-end. However, they also expect the ECB and Draghi to argue that the policy stance is not tightening. Indeed, they expect a classic ‘dovish tightening’ bias to the event. The team expects Draghi to say that “the market understands the guidance”, meaning the delayed pricing of the first hike is broadly appropriate. They also expect Draghi to hint that the TLTRO2 liquidity will be replaced in 2019. Overall, the risks today are balanced to a more dovish outcome. It is not just that the ECB staff forecasts are likely to be downgraded, the balance of risks could also shift to the downside. At the softer end of options, the ECB could make a dovish revision to the forward guidance on the timing of reinvestment tapering and among the stronger responses are a twist of the asset portfolio. This could come within the details of the reinvestment programme, which are due. We’ll know for certain later with the decision due at 12.45pm BST and Draghi’s press conference shortly after. Back to yesterday, where, not to be outdone, emerging markets were also back in vogue following the headlines that hit in the morning quoting Turkey President Erdogan as saying that Turkey will “start an operation in Syria within days”. The Turkish Lira immediately sold off as much as -0.54% on the news, but the move appeared to be more kneejerk in reaction than anything else as it ultimately closed slightly stronger, up +0.37% on the day. EM FX more broadly was +0.58% while the MSCI EM equity index ended +1.46%. This came despite another slip in oil prices, with WTI down -0.97% as data showed that US oil inventories fell only -1.2 million barrels last week compared to the expected -3.5 million barrels. That’s the 12th time the inventories data has shown a smaller drawdown than expected over the last three months, the longest such stretch since April 2015. As for the other economic data that was out yesterday, in the US, mortgage applications data showed a +1.6% week-on-week increase. That’s the third consecutive monthly increase, the best streak since March, and maybe a sign that recent housing sector weakness may be bottoming out. In Europe, October’s industrial production ended up being a bit of a wash with the stronger than expected October reading (+0.2% mom vs. +0.1% expected) offset by a downward revision to September to a sharper -0.6% mom decline (versus -0.3% previously). In Italy, the unemployment rate dipped to 10.2%, a new cycle low and the best print since Q1 2012. In terms of the day ahead, a combination of the follow through from last night’s confidence vote on UK PM May and the aforementioned ECB meeting later today will no doubt be front and centre. Aside from that we’ve also got the final November CPI revisions due in Germany and France this morning while this afternoon in the US we get the November import price index print and latest weekly initial jobless claims reading. The latter is well worth keeping an eye on in light of the recent uptick in claims. Indeed, the four-week moving average has risen from a multi-decade low of 206k in the middle of September to 228k as of December 1st. Away from all that, EU leaders are also due to meet today in Brussels to discuss the EU budget and Brexit amongst other topics.